Making Art, Talking Life, Living it UP!!! Our main purpose here at IE is to challenge ourselves, each other and YOU to take the creative process to the next level; to inspire growth and change in our scrapbooking beyond the mundane. You can see all of Inspiration Elevator's previous challenges at on Facebook .
" 'cos Autumn is all about layers of leaves and layers of jumpers (in the northern hemisphere) I would like to challenge you to add lots of layers to your page....this could be layers of paints, inks, stamps, papers, glassine paper, acetate....lots of lovely layers." My page started as a mass of pop dot clusters all over the page but I realized I wanted a more clean look because I wanted to display this page in my office..
Papers, die cuts and chipboard are all Crate Paper. Flair is from A Flair For Buttons on Etsy. I lost my precious iPod Touch a couple of weeks back so I had very little material to work with. Thankfully a friend who lost her entire photo library last year (THE HORROR!!!) 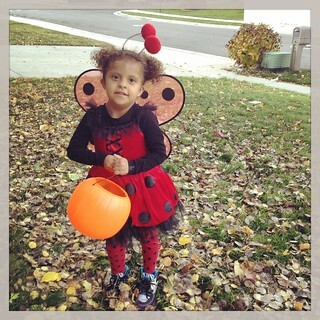 convinced me to back-up everything up into iCloud so my photos are safe. I just don't have access to them till I buy a new Mac device and since I refuse to pay outrageous data charges or buy a new iTouch with an inferior camera it's gonna be a while before I can print my pix. Die cuts are the easy way to create layers. We encourage you to check out each designer's creation this month: here's a complete list of this month's participating designers! Why not give the challenge a try yourself? Then pop by our Facebook page and share with us what you created! I have a second back up- Flickr. So this fall photo is safe. This week's Inspiration Elevator theme- surviving loss really speaks to me. getting real for keeping things light and positive. There's something to be said for that, after all, those who love you already know your trials. But talking publicly about what's really happening in your life is also a fantastic means for catharsis. And for finding out how you really feel. Sometimes the most important stories are the saddest. Those are the stories that show personal heroism and tenacity- true character. 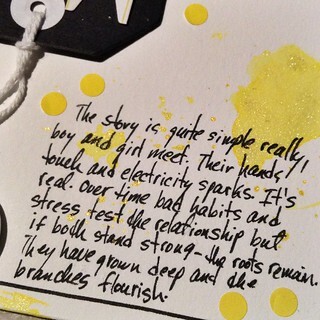 Journaling, photographing, getting creative with talking about the hard times helps me immensely. The main benefit is in helping me work out how I truly feel. It keeps the negative inner talk to a minimum and helps me gain perspective. Most importantly, it makes those little moments most precious. As usual, I worked on this late at night so my lighting for the photo is way off- my apologies. My page is about my marriage. Lately our communication has been fraught with negativity. I wonder about the nature of our bond, is it strong enough to withstand all the external frustration we feel in our current economic and housing situation? Am I doing all I can to keep it strong? Could I lose the central relationship in my life? That second questions scares me because I've always thought my marriage was strong. I waited a very long time and made sure I was emotionally ready for the marathon. My page isn't about loss. It's about the fear losing something precious engenders. I realized love doesn't change in a relationship but it can take second place over ever changing challenges if you let it. I won't let it. And I made a page to remind myself. You can catch us on Facebook and share your creations there; we'd love to see how we have inspired you! This month we are thrilled to welcome back as a guest designer with our team, the artistic and genteel, Scarlett Salomone. Her creative works are as lovely as she is! LOSS... One thing we as scrapbookers do is post about lots of happy things, wonderful moments, things that make us smile, and things we want to remember. Too many times we avoid scrapping the not so memorable, or sad times. Most of us have experienced a loss of some kind, whether is be a loved one- sometimes it's expected, sometimes the loss comes too soon and unexpected. Other times we lose a pet, a job, feel like we've failed at a situation, or loss of a friendship. This time, let's scrap those harder moments that come into our lives. Scrap about a LOSS of some kind. Swing by the blogs and see what the other designers have done to represent their personal challenges and triumphs. I hope you are inspired and take a swing at the challenge for yourself. 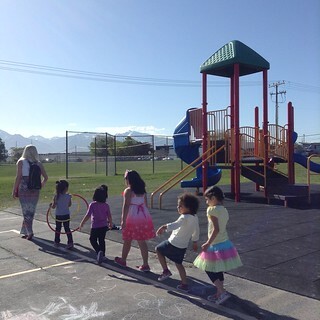 Guess which pre-schooler is mine? Welcome to another month of Inspiration Elevator! You can see all of Inspiration Elevator's previous challenges at our blog and catch us on Facebook and Instagram (soon!) too. This month's challenge is issued by the innovative Michelle Hernandez. 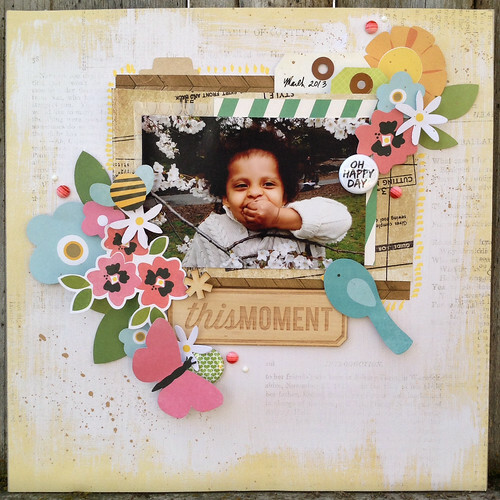 Michelle's style is about telling the story with a clean and simple, yet artsy approach, an awareness of current trends, and garnished with her use of chipboard and often neutral colours. The challenge for June 15th is- make a public scrapbook page. You are making a page to go up at work or to give away to a family member to put up in their space. In your blog post you will tell us how knowing this page isn't going in a book or in your home changed your style. Did you go all out and make something that is 3D? Did you suppress your love of a particular color or product? How do you feel about the page being public- outside your regular audience of scrapbook lovers who read your blog or open your books at home? whatever programing language ipods use to display images. When I thought up this challenge I had several family portrait projects in mind. Working on those made me realize how much my style changes when i'm working for someone else. I tend to keep my palette low contrast and light. I also stay away from messy techniques and mediums because I assume most people don't want a page with lots of paint spatter or wonky layers. I made this for a co-worker who loves the color blue. Yes, I know. I wanted to keep design time to an hour so I used a single collection pack and made my layers neat so she wouldn't mind putting it up in her cubicle. but she assured me that was a good thing. WHEW! I used the Twenty 3 collection from Cosmo Cricket- arguably one of the most challenging color combos I've ever come across- orange, pink, mustard yellow and grey. Or as far away from blue as possible. This page will match our office decor and hopefully be quiet enough to allow her to use any horizontal 4x6 family photo. I plan to make a second page for her in her favorite color but that will come later- picking and matching items is what usually takes me hours to decide. Here's a complete list of this month's participating designers! We encourage you to check out each designer's creation this month, then come on back and give the challenge a try yourself! We have a couple of regular artists taking a summer hiatus and look forward to the return of Joanne Burton and Christa Uttley in the fall. Meantime, if you've wanted to participate as a guest designer with Inspiration Elevator, just contact team lead, Ann at ann jobes at bell dot net. Now it's your turn to get creating about art you share publicly, and share your blog link at the IE blog. We would love to see what you were inspired to make! A Flair For Buttons Scrapbook extraveganza! 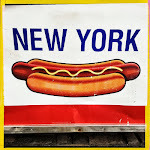 Hello and welcome to the A Flair For Buttons Blog Hop!! I'm so excited to be part of this team. I genuinely love Shelley's flair- the color- the variety of designs and themes. I love to add the word flair as part of a title or layering patterned ones to add pop to an otherwise flat page. paper from Crate's "DYI"collection which I bought for 5 bucks at TJ Maxx. I love this pre-school portrait photo. Not sure Lola's 12 year old self will agree but I still love it. I love that fox sweater from Gymboree! Only now do I realize the Fox and Owl flair would have been perfect for this! It's been great being part of this team for the last 2 years. Thanks Shelley for being so supportive! On to creations by the rest of the team! I've dropped quite a few Instagram accounts because the content is almost all "selfie". Neither says anything genuine- or rather it says entirely too much- all negative. I think women should fully own their image. As story tellers it's crucial, we wield the camera and write down the details. 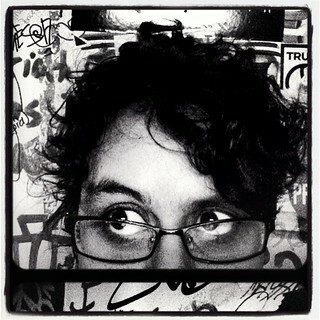 If we don't make sure to turn that camera around once in a while we will be invisible in our own story. Regardless how we currently feel about our physical state, our children enjoy seeing us smile and celebrating life. It sets a good example to love ourselves as we are. Even better- it measures how far we've come when we've decided to change something. This month's Inspiration Elevator challenge is- take a selfie! I like scrapping selfies because they make the creative process easier. I can focus on my current feelings or on a story I want to tell- not on trying to find matching embellishments for a theme page. The page below was all about my feelings on moving. 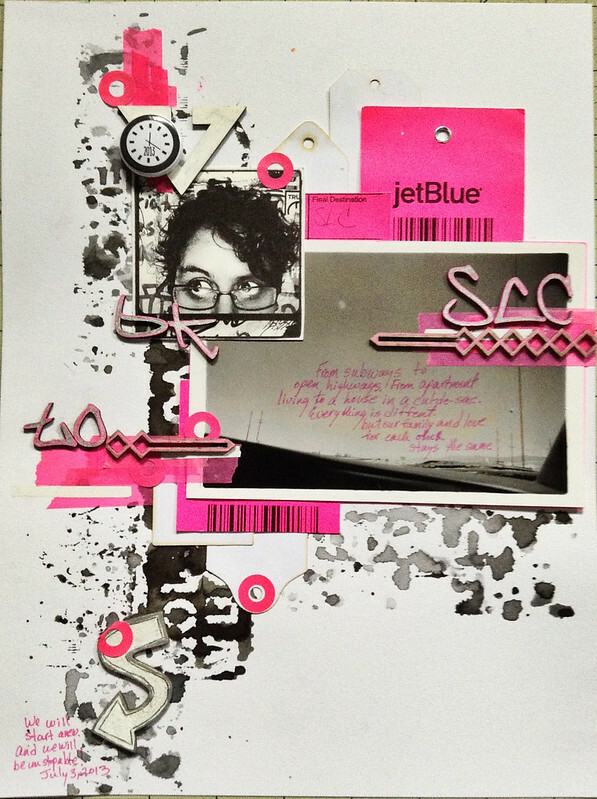 I had some really cool chipboard and a neon pink Jet Blue luggage tag but that's it. I could have used some travel themed printed items but since my feelings were mixed up this seemed more appropriate. Photoshop and a home printer I made it into a 4x4 on Instagram and used my local Walgreen's for the print. 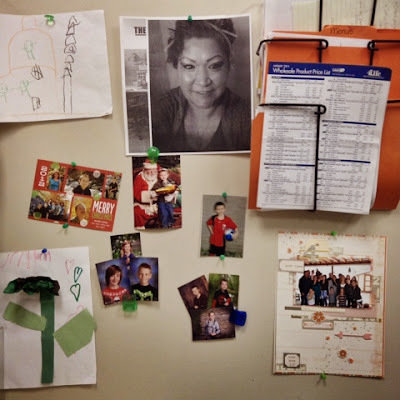 The purpose of the Inspiration Elevator challenge group is to take our scrapbooking to the next level, to stretch our creative process and to mature as artists by embracing challenges that make us think, work and grow. You can view all of the challenges at the Inspiration Elevator Blog. This month we are celebrating our anniversary with a BLOG HOP! So be sure to hop from blog to blog below as some of our designers are offering prizes! 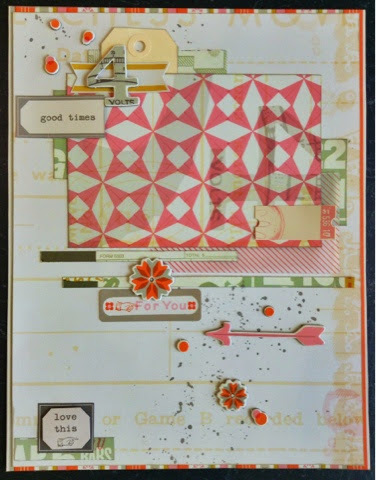 We also welcome Katherine Sutton as a guest designer to Inspiration Elevator! 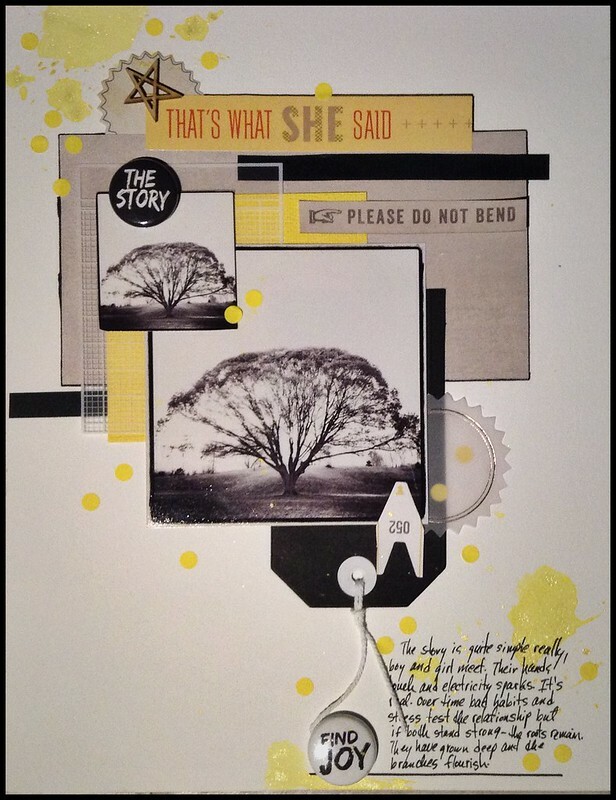 Katharine has Guest Designed for us and her fabulous style will inspire you to take your scrapbooking to a new level! It's a 2-part challenge since it's created by Christa and Ann! The first part of the challenge is to use a selfie. We are all a part of social media to some extent, so selfies are everywhere. "Call it another trend in narcissism, or call it art, but the "selfie" has become a mainstay of our virtual identity." 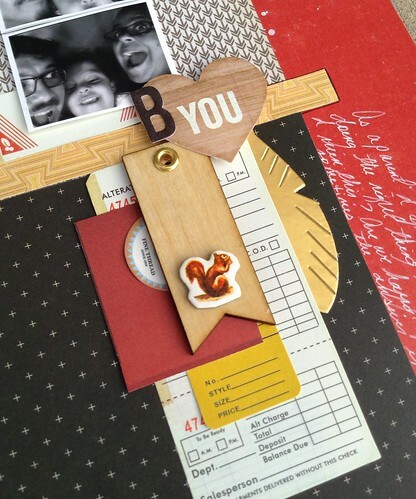 This month we'd like you to share something about scrapbooking. It could be why you scrapbook, what you love best, what you get out of it, your most amazing experience or, where you see your craft/hobby/art in the future. I hope you feel inspired to play along with our challenge this month, and when you do, please share it using the linky tool on our Inspiration Elevator blog and/or our Inspiration Elevator Facebook page. We'd LOVE to see what you made! This is totally about my new haircut. Taken 2013. 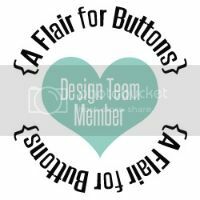 A Flair For Buttons DT! 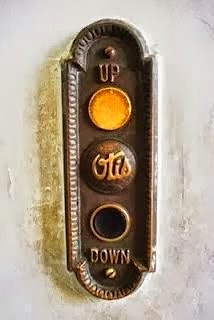 Inspiration Elevator- Scrapping a favorite childhood memory.